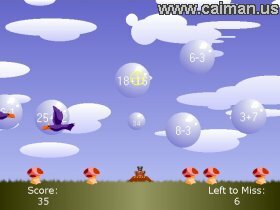 Caiman free games: Bubble-Sums by Blackratstudios - D. Eugene Perry. 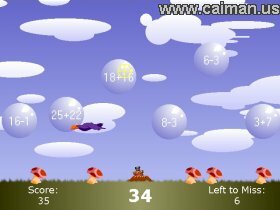 Bubble-Sums will teach math skills in a, hopefully, fun way to kids. The player controls a bubble-gun on the ground. Flying overhead are bubbles containing math equations. The player must input the sum or difference into a small bubble and launch it at the larger bubble. If the answer is correct, both bubbles will burst. If it is incorrect, only the smaller bubble will burst and the player will have to try again. Allow too many bubbles to leave the field and the game is over. Mouse: Aim the crosshair at the large bubbles. Left mouse button: Shoot a small bubble. Number keys: Input the answers. F4: Switch between window and full view. Escape: Close the highscore window or stop the game in the actual play area and return to the menu.